The Raffles Istanbul gambled on its choice of aesthetics, and they’ve pulled it off superbly well. Instead of traditionally bedecking the hotel in Ottoman or Byzantine fare, they opted for a sophisticated, modern look – and chose the business district, of all places, as the hotel’s location. Inside you’ll find a quirky blend of Turkish and international art; corridors that are garnered with Ottoman-inspired glass panels; a lobby that boasts pools, a giant sculpture and an enormous Neoclassical faience wall panel. 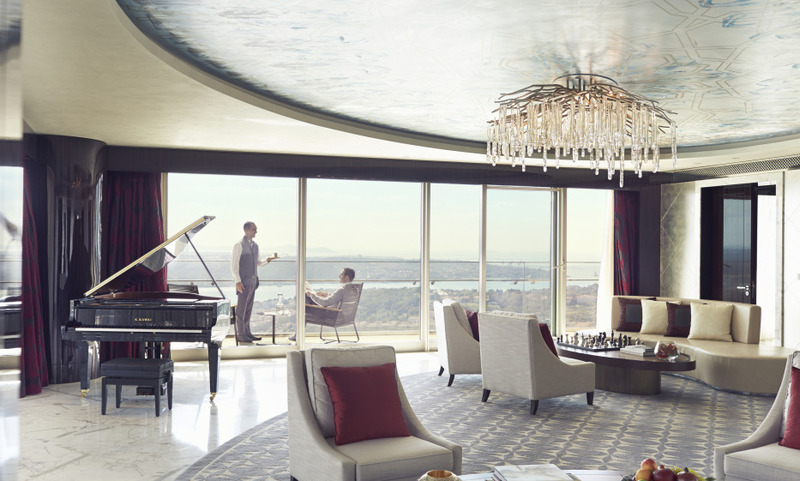 The rooms floor-to-ceiling windows are a treat, offering extraordinary views over the city. All rooms and suites have private balconies / terraces and offer at least 62sqm. Enjoy the direct connection to the rooftop helipad and the Zorlu Center with its various restaurants, cafés and luxury boutiques. Arola by the Michelin-starred chef Sergi Arola offers creative tapas style plates, a balance between the modern and the traditional, that are ideal for sharing. Amazing hotel. Very beautiful and the concierge, Mete, was extremely helpful.